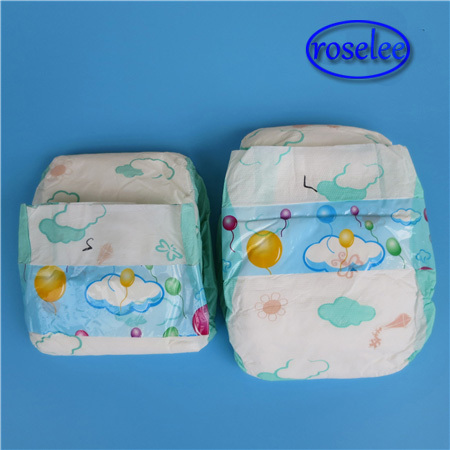 China High Quality Baby Diapers Manufacturer: High Quality Baby Diapers, Dry Surface, Blue ADL, 3D Leak Guard & Leg Cuffs, Breathable Backsheet. Name: High Quality Baby Diapers. Anti-Leak: 3D Leak Guard and Leg Cuffs. Feature: Dry Surface, Blue ADL. 1. It is skin friendly fitting, comfortable. 2. Wet indicator, prompt changing in time. 3. 3D leak guard, avoid the side leakage and soft for baby’s legs. 4. Blue Core: spread the urine quickly to absorbent core.